This post was originally published by the Center for Cooperative Media and is republished with permission. The collaboration was awarded a $7,000 grant by the Center for Cooperative Media as part of an open call to fund collaborative reporting projects, which was made possible with support from Rita Allen Foundation and Democracy Fund. For a journalist, combing through tens of thousands of records dating as far back as 1990 is no easy task, no matter how big the operation. But through collaboration, two small non-profit news groups were able to peel back the layers of a complex tax issue crippling schools across the Midwest by pooling resources and trading original local and regional reporting. 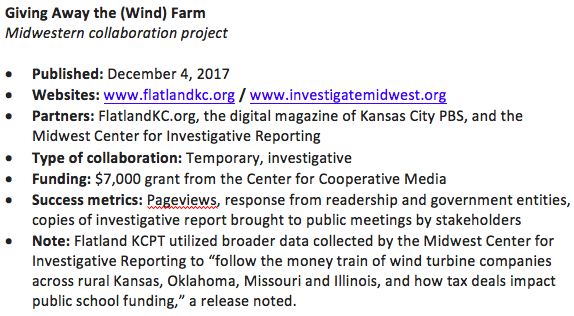 Deemed one of the top six journalism collaborations of 2017 by MediaShift, an investigation by Flatland (KCPT’s digital magazine) and the Midwest Center for Investigative Reporting shed light on the consequences of Kansas’ efforts to attract wind farms via lifetime property tax exemptions. They looked deeply at how those exemptions left local school districts starving for revenue. Funded by a Center for Cooperative Media grant, the two-part series took nearly a year to execute but produced immediate results upon its December 2017 launch. State officials started using its original reporting to spark new negotiations with wind turbine companies. By the end of the investigation, Kirstin McCudden, managing editor of digital and multimedia content for Kansas City PBS, said the non-profits found that such exemptions left roughly $630 million in Kansas wind farm equipment untaxed, depriving 24 rural counties of about $82 million in additional revenue each year. The Midwest Center for Investigative Reporting, she added, helped to expand the focus to the broader perspective, where federal tax cuts spurred an increase in foreign investment into wind farms across the country. The story started as a tip the late Mike McGraw received from a member of the school board in a district not far from a wind farm. McGraw, who worked as the lead reporter for Flatland on the project, took a closer look at the PILOT agreements, a.k.a. “payments in lieu of taxes,” making Kansas a wind-farms hotspot. At the same time, Flatland was already in the middle of a year-long project on education in the metro area, and merged the two ideas, exploring how the PILOTs and lifetime tax exemptions affected local school funding. McCudden said the Flatland piece, “Giving Away the (Wind) Farm” and each of its accompanying sidebars took the lead on the local level while the Midwest Center for Investigative Reporting focused on the regional and national scope of the issue. By the project’s end, McCudden said the groups compiled a large swath of original reporting and interviews from various Kansas Department of Revenue officials, wind lobbying firms, Kansas school superintendents, county clerks, financial experts and more. The investigation was gigantic in scope, but the non-profits that came together to make it possible were small. Flatlandkc.org, the digital magazine of Kansas City PBS, followed McCudden’s lead. Her newsroom team included lead reporter Mike McGraw, reporter Ryan Hennessy, photographer Brad Austin, editor Bill Dalton and data visualization editor Wes Mikel. The Midwest Center for Investigative Reporting team was led by editor Pam Dempsey, reporter Johnathan Hettinger, editor Brant Houston, and photographer Darrell Hoemann. 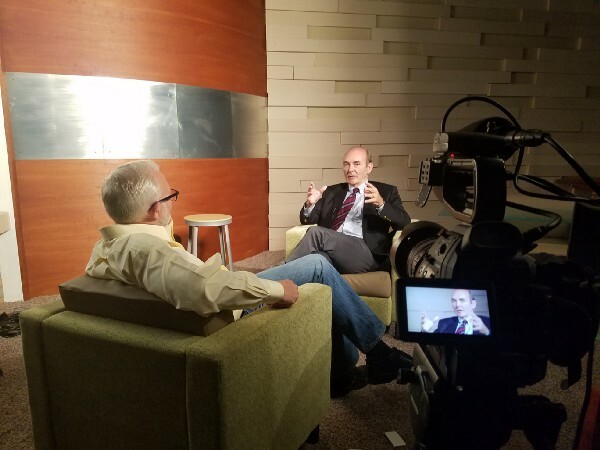 Special Projects Reporter Mike McGraw interviews Chicago-based property tax consultant Barton Delacey in the Kansas City PBS studios in August 2017. Photo by Brad Austin. The teams largely worked separately and remotely, but remained in constant communication. It was largely McCudden and Dempsey who worked in tandem as the leaders of the collaboration, which McCudden said was made possible through phone and email communication — the former, she added, was far more efficient and direct than the latter. The groups used the typical forms of remote communication but also utilized technology like color-coded Google Docs to stay organized and on the same page. Programs like Microsoft Excel and Tableu were also key to the team’s success, staffers said. Flatland led the project, while the Midwest Center provided data analysis and original reporting that McCudden said provided a more expanded context. Flatland oversaw the final edits to the piece, while Houston was in charge of edits from the Midwest Center side of the investigation. The stories launched in tandem on Dec. 4, 2017, and the team reported back tangible results. Kansas’ Republic County economic development department was one of the first entities to reach out, using information the collaboration published to begin negotiations with a wind turbine company at an above-average payment-per-megawatt plan. McCudden added that county officials were showing up to meetings with wind turbine companies with copies of the article in hand. The piece was also subsequently picked up by regional and national news organizations. The collaboration built an original analysis of what property taxes would be for the wind turbines and stacked that reporting up against what they were actually paying under the PILOTs on the books. And for the national data, they analyzed records to find trends in foreign investment, including states with the most investment, cost and time, McCudden said. All of the analyses were done in-house via Flatland with a contracted data visualist provided by Kansas City PBS. It was that investment that allowed the piece to shine with various data graphics bringing the complexity of tax data into an easy-to-follow visual form. At the Midwest Center for Investigative Reporting, Dempsey and Hettinger teamed up to contextualize all analyses on their end before they were subsequently fed to Flatland’s staff. Most of the grant money had gone into the reporting aspect of the project. Via open records requests, some free and others at a cost, the groups were able to compile PILOT agreements from the affected counties. But getting their hands on documents from all 24 counties was no easy task. What was even more important than the nitty-gritty reporting, however, was the team’s ability to firmly grasp the volume of documents obtained for the investigation and to develop an understanding of what McCudden called the sordid history between the state and public school funding. Houston echoed the sentiment, adding that tax credit and lien information had to be compiled from different states and took a lot of work and verification before they could be inserted into the story. The foreign investment in the U.S. farmland database had omissions and errors as well, which took time and resources from the newsroom to rectify, he said. When looking at Kansas data, McCudden said the team found a discrepancy with the Department of Revenue’s numbers, which led to a mini snafu among the newsrooms. Faced with a decision to make, McCudden and her team decided to go back to the state source, which ultimately acknowledged the error and stood corrected as a result of Flatland’s reporting. 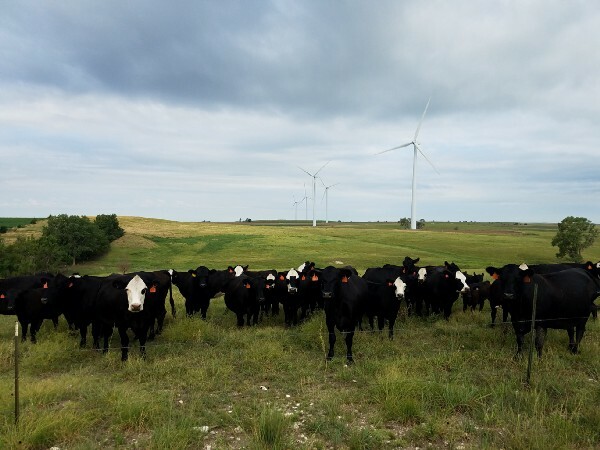 Flatland photographer Brad Austin encounters some curious cows while shooting a wind farm near Salina, Kansas, in July 2017. Photo by Brad Austin. The Midwest Center said that for the national databases, it spot-checked and looked for anomalies in the data. Given the self-reported nature of the information, however, and that most was entered by hand into a federal database by an understaffed office, that it could only be transparent about any flaws. Not all the challenges were clerical, though. Austin said that making sure his photography was accurate was just as difficult. Bringing together two news teams to report on the same topic may have increased the manpower, but it also made the responsibility that much greater as the scope of the coverage expanded. McCudden said the pooling of resources and talent helped her team, along with the Midwest Center for Investigative Reporting, tell a more in-depth story than either of them could have done otherwise. Both sides made sure to complement each other. McCudden pointed to one pivotal moment during the collaboration in which her Flatland team was combing through the state’s documents and had found a discrepancy in the numbers they were given, and were unsure as to what to do next. They were debating whether to still publish the official figures given to them from the state sources, or to use theirs, or to go with both sets of numbers and explain the discrepancy in the story. That was when collaboration came in handy, she said. It was that advice that ultimately led to her team’s validation from the state, which admitted its error and confirmed the work of Flatland’s research team. She also said that having two female editors — she and Pam Dempsey — taking the lead for each respective side of the collaboration created an interesting dynamic for both newsrooms involved. Houston said the key takeaway for him was that each newsroom had agreed to a structure and stuck to it throughout the investigation. Hennessy said the key takeaways came from working his way through the material alongside the late Mike McGraw, who died after a brief battle with cancer not long after his final piece was published. By the project’s end, he said, his main lesson learned was to simply work hard and stay humble. “Mike McGraw picked the topic, and told me my first week as an intern that he’d like to know how much these wind farms in Kansas would pay if they weren’t exempt from paying taxes,” he said. “I found the answer, proudly, after about six months of research. It was such a pleasure and honor to work with Mike, I can’t say anything else made me feel a greater sense of accomplishment. This project was awarded a $7,000 grant by the Center for Cooperative Media as part of an open call to fund collaborative reporting projects, which was made possible with support from Rita Allen Foundation and Democracy Fund. Phil Corso is an editor, educator and journalist from Brooklyn, NY. He has worked with outlets including the New York Post, New York Daily News, amNY, Westchester Magazine and more. He’s also worked as a professor of journalism at Queens College and advised journalism students at Purchase College, his alma mater.